This issue of the electronic journal of education and science is devoted to a wide range of issues related to various interpretations and aspects of identity as a socio-cultural phenomenon. The problem of identity does not cease to attract the attention of both academic researchers and the general public, since in the modern world various issues of identity — ethnic, national, religious, gender and so on — have not lost their sharpness and relevance. Moreover, we can talk about another wave of interest in this topic. The articles presented in this issue cover a wide range of problems, united around the central theme of the issue — identity. 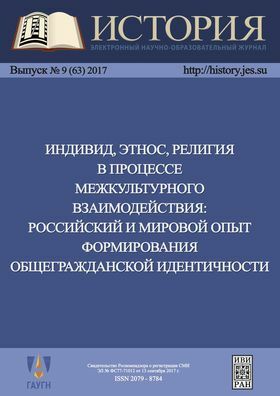 The issue presents both general works devoted to various dimensions of identity: historical, spatial, ethnocultural, regional, and articles on specific issues. Among them — the history of interstate/interethnic interaction, the role of the state in the formation of national identity, commemorative practices, the refraction of identity through the lens of social protest, the interaction of religion and state power, the personality of the researcher in the perception of history.